They say happiness can’t be bought, but for me, happiness can come from a can. In this case, from a can of Black Pepper SPAM. A much maligned processed canned food product, SPAM is the definitive mystery meat. I mean, where else can you find meat that comes in blocks? But its mysterious nature notwithstanding, SPAM still brings me happiness, when it’s fried to a light crisp then served with rice. Bringing that same happiness to my lunchbox are these little flower-shaped Black Pepper SPAM on rice. To make, I sliced the SPAM, cut with my vegetable cutters then lightly pan-fried both the flower-shapes and the slices I cut them out from. To avoid wasting anything, I simply hid the slices with holes under the rice. To contrast against the SPAM, I also packed some cucumber slices (flower-shaped again), a bit of vinaigrette for the cucumber, cherry tomatoes, and weirdly enough, century egg wedges and spring onion stalks for the egg. Not quite a combination you’d think of but I wanted to eat century eggs that day. That’s the nice thing about being a grown-up. You can eat what you want, whenever you want. Unless the doctor says you can’t. Wondering what to do with leftovers from using veggie cutters? Don’t throw them away. Chop them into even-sized pieces for quick additions to sautÃ©ed dishes or fried rice. Or, you can still include them in your bento, just hide them under the other food. 13 Responses to Spam! Spam! Spam! Although I *try* not to eat spam now, I still can’t resist those crispy, toasted nuggets of goodness when they’re on the table. I love chopping spam up into little cubes to get more surface area to brown. yumyum! spam is delicious when cooked the right way. i don’t like onion stalks. i put chopped onion stalks in arroz caldo out of tradition rather than taste. Having grown up in Hawaii RAISED on Spam musubi, I love it to this day. (Made some yesterday, and was psyched to see this post!) Lightly fried with shoyu and sugar…wrapped up with sticky rice and nori…How can you possibly resist such a taste treat? They travel well too if you put them in plastic wrap- great to take along on hikes. They’re not as cute as your spam sakura though! Thanks for such a fun blog!! I love Spam and Meilin (the other luncheon meat – round blocks!) thinly sliced, dusted with brown sugar, then fried to a crisp. The sugar brings out a caramel flavor in the meat, and the slices are like bacon, eaten with lots of rice, and some tomatoes. Bad for those of us with high blood pressure! I saw that there were many other flavor of spam, I don’t like turkey, smoked is alright, the normal one taste the best but I also want to try bacon. Wow, I never really stopped to think about it but now that you mentioned it, yeah! More browned surface area, more spammy goodness! Hehehehe, I used to hate spring onions too, but would you believe I grew to like it? Turkey spam? I never tried it. I guess I should try other things out of my Regular, Lite and Black Pepper box. I agree though, ang mahal na n’ya! Thanks Malia! I’m glad you’re liking it here. About the Spam musubi though, I never tried it with soy and sugar. Your description makes me think it’s about time I try it the way Hawaiians prepare it. Next time I pop open a can, I’ll be sure to try it your way. Brown sugar? Never tried it that way but your description is killing me! I’ve half a mind to rush to the grocery, buy more, and try it tonight! And heehee, I remember Ma-Ling from my childhood, back when US imported goods were too expensive and Spam was a luxury. Do they still make it? There’s a bacon flavored one? I have to look out for that. So far, the only ones I’ve tried are regular, lite, low sodium, black pepper and tabasco….mmmm…Tabasco. Killer good, needs a gajillion cups of rice to go with it. Hi. 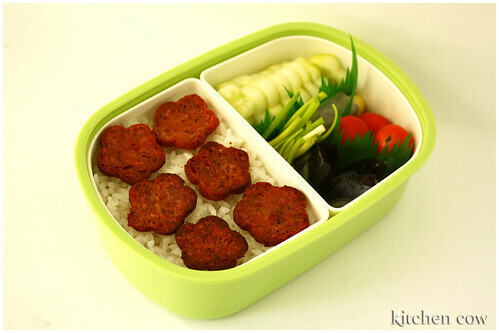 Your bento creations are so cute! I’m amazed with your site. You are so good at this! By the way, I’m Filipino like you and I’m so fascinated with Korean and Japanese cuisine.I hope you can guide me as to what stores sell quality bento boxes here in the Philippines. As to bento boxes, where are you based? Is there a Japan Home Center / Daiso 88 Peso Store nearby? These stores, as well as the My Dollar Store can be good sources of bento boxes. It’s subject to availability though so it’s good to keep checking back. Department stores like SM are good sources too, especially during back to school season. Lastly, I recommend checking Japanese and Korean groceries because they sometimes stock both boxes and accessories. Hi, kaoko. I bought my bento box from one of Davao’s department stores yesterday. I’ll check out SM City Davao one of these days. I must admit, however, that I’m currently home-based so I just have to try my hand at preparing my lunchbox in the mornings, carefully set it aside for a few hours, and then eat out of it during lunchtime! Btw, my boyfriend says you take really good pics.